He had Basic at Greenwood, MS. He graduated at George Field in Illinois (S/N:O-804275) was a B-24 pilot assigned to the 382nd Bomb Group 538th Bomb Sqdn flying training missions in the U.S.A. and was killed in a collision with Clift Ridge near Elk, California on October 1, 1943.
from Ocala, FL. in 1942. John Ayres was his Instructor. He had Basic at Greenwood, Miss. He graduated at Craig Field (S/N: O-801462). Then checked out on p-40, A-36 and p-39’s. Then was assigned to the 339th Fighter Group 503rd Fighter Sqdn flying his missions from England in P-51’s. He had an accident in one and was returned to the U. S. on a hospital ship.He flew 100 missions in Korea and was flying jets. He was credited with 28 Victories, 21 in Europe and 7 in the Pacific. He regained his health and was a Corporate Pilot. He had a total of 19,000 hours. See also book by crew-mate Andrew Anzanos “My Combat Diary with Eighth Air Force B-17s 390th Bomb Group”. of St. Paul, MN in 1942. Student Officer: Second Lieutenant, Squadron A. He had Basic at Greenwood, Miss. He graduated from George Army Air Corps Field, Lawrence County, IL. S/N: O-460073. He was an A-20 pilot assigned to the 417th Bomb Group 672nd Bomb Sqdn flying his missions in the South-West Pacific Area. He had 74 missions. Student Officer: Second Lieutenant, Squadron A. S/N: O-464693 Ord-Res. He had Basic at Greenwood, Miss. He was lost in action over Holland while flying a P-51 for cover for Adam Parsons (a class mate from Douglas) who was flying a bomber. Click here for more information. He had Basic at Greenwood, Miss. He graduated and went into bombers. He was with the 1st Air Force and flew B-29s in India. He was scheduled to return home, but was sent to the Marianas instead. He was shot down two times, lost the airplanes, bellied one in. The 3rd time, he was shot down over Tokyo, Japan. Information below from MACR (Missing Air Crew Report): He was with the 21st Command, 444th Bomb Group, 677th Bomb Squadron. On May 25, 1945, he was flying as a 1st Lieutenant and copilot on a B-29 (S/N: 42-24724) leaving Tinian, Marianas on a combat mission with the intended destination of Tokyo. The plane issued no messages and went missing, with all of its 11-person crew MIA. He was from St. Paul, Mn. Merrill Nelson was his Instructor. He had Basic at Greenwood, Miss. He graduated from Twin Engine at Blytheville. Later he was sent to England with the 388th Bomb Group, flying B-17’s. He was shot down on May 29, 1944 while over Leipzig, Germany and became a P.O.W. (MACR #5312). O. E. Pierce was his instructor. He had basic at Greenwood, MS.
of Akron, OH. in 1942. Charles Sherrill was his instructor. 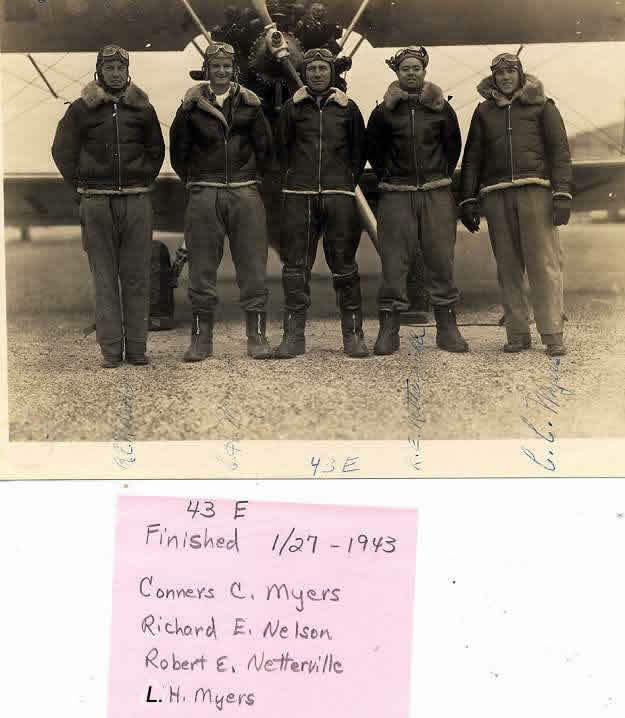 He had Basic at Greenwood, MS.
http://www.armyaircorps-376bg.com/kamps_aloyx_crew.htmlHe was awarded the Air Medal with 2 Oak Leaf Clusters, Purple Heart. Had Basic at Greenwood, MS. He had Basic at Greenwood and graduated from George Army Air Corps Field, Lawrence County, IL. S/N: O-804307. Had Basic at Greenwood, MS. S/N: 39165283. He was an Avn Cadet assigned to George Field, IL. for flight training and was killed in a crash of his AT-10 2 miles south of George Field on May 3, 1943. Merrill Nelson was his instructor. Had Basic at Greenwood, MS. He left Harvard to become a World War II fighter pilot. His instructor at Douglas was Rainville. He remembers his time in Douglas and writes about it in his book. He took Basic at Cochran (in Macon, GA) and Advanced at Jackson, Miss. He became a fighter pilot in the 15th Tactical Reconnaissance Sqdn. in the Ninth Air Force (European Theater). After the War, he returned to school to become a physician. Goodale was propelled into a successful medical career after a brief but intensely emotional experience in 1945 at the Buchenwald concentration camp in Germany. He wrote the book, The Absolute Truth and Other Uncertainties: A Remembrance (2005) about his life in the service, his career and his family. Had Basic at Greenwood, MS. He graduated at Craig Field (S/N: O-803370). He was a B-17 pilot assigned to the 305th Bomb Group 364th Bomb Sqdn flying his missions from England. He served in the Massachusetts Air National Guard in 1947 flying P-47s. Had Basic at Greenwood, MS. He was assigned to the Central Instructors School located at Randolph Field, TX for training to be an instructor pilot, and on June 23 1943, was involved in a minor landing accident in an AT-10 at the field. 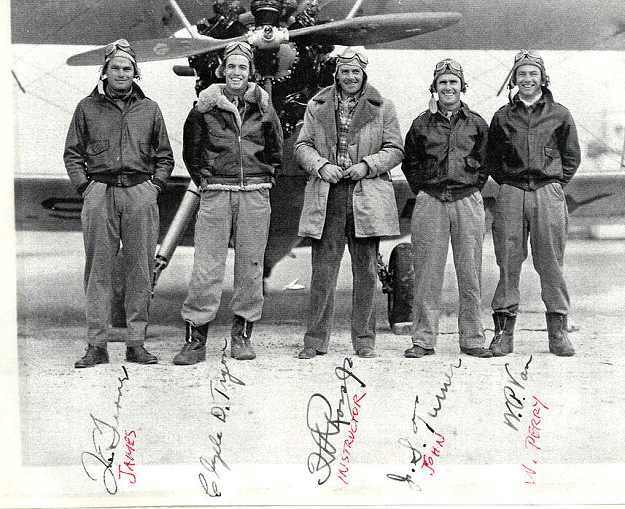 He served as a pilot and flight instructor with the U.S. Army Air Corps in Arkansas. There, he met his future wife, Golda. After the war, they settled in Caldwell, NJ. See more at: http://obits.nj.com/obituaries/starledger/obituary.aspx?pid=147304158#sthash.r61oalKy.dpufHe had made the rank of Major USAF by 1954. Had Basic at Greenwood, MS. He graduated at George Field (S/N: O-804335). He was a B-24 pilot assigned to the 446th Bomb Group 705th Bomb Sqdn flying his missions from England and was shot down by a pursuit plane on February 25, 1944 near Mittersheim. The entire crew bailed out safely. He became a P.O.W. imprisoned at Stalag Luft #1, Barth, Germany (MACR #2952).Retired USAF Major 01/31/62. He had Basic at Greenwood, Miss, and graduated from George Army Air Corps Field, Lawrence County, IL. S/N: O-804340. He was killed in action. Click here for more information. 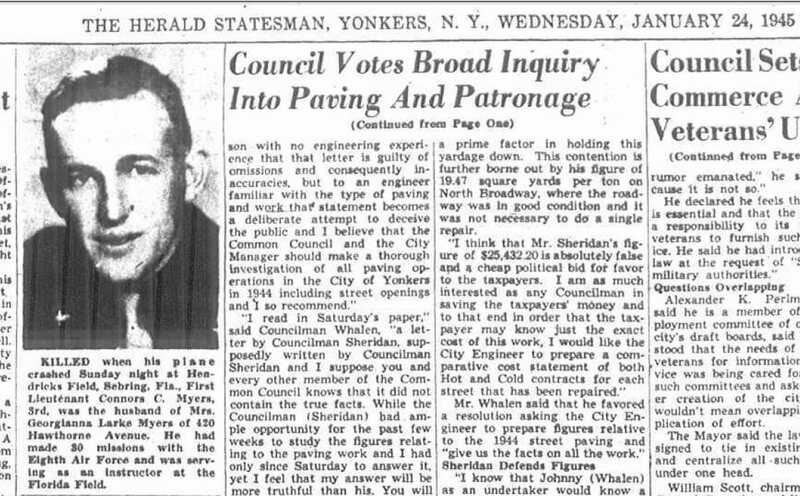 Of Brooklyn, N.Y. in 1942. Had Basic at Greenwood, MS. He was a B-17 pilot assigned to the 301st Bomb Group 32nd Bomb Sqdn flying his missions over Southern Europe. He completed 50 missions. He received the Distinguished Flying Cross on what was counted as his 6th and 7th missions. It was over Budapest Hungary on April 3, 1944. His first mission was on 3/22/44 over Verona, Italy and his last mission was on 7/5/44 over Montpellier, France. Total flight time of 245 hours 30 minutes. He finished WWII as a Capt. 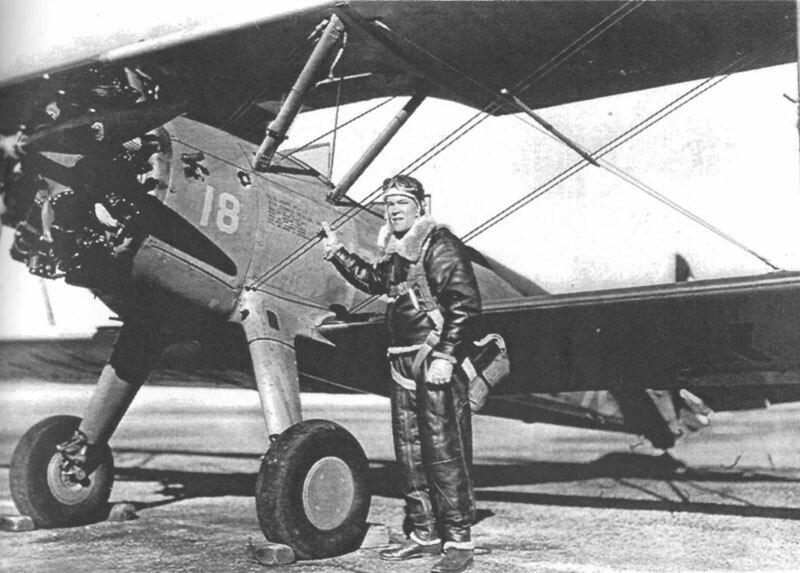 He later retired in 1968 as a Lt Col.
Click here for a picture of him with his Stearman at Douglas. Charles Sherrill was his instructor. Had Basic at Greenwood. He graduated with the Class of 43-12 at Kirtland Field in Albuquerque, NM on August 26, 1943 (S/N: O-752682). He was a B-17 bombardier assigned to the 97th Bomb Group 340th Bomb Sqdn flying missions in Southern Europe and was shot down on April 2, 1944 becoming a P.O.W. imprisoned at Barth, Germany (MACR #3583) . Had Basic at Greenwood, MS. Graduated from George Army Air Corps Field, Lawrence County, IL. S/N: O-804351. Had Basic at Greenwood, MS. He had graduated from the Class of 43F at Craig Field (S/N: O-805639). He was a P-40 pilot stationed in Hawaii in September 1943. In October 1944 he was a P-38 Lightning pilot assigned to the 18th Fighter Group 70th FS flying missions from Munda Air Strip located on New Georgia in the South Pacific, when he gave a deposition regarding a missing plane (MACR #15178). Had Basic at Greenwood, MS. S/N: 16008707. He was assigned to Shaw Field and was killed in a flying accident in a BT-13 on March 23, 1943 near Greenwood, Mississippi. Had Basic at Greenwood, MS. Graduated from George Army Air Corps Field, Lawrence County, IL. S/N: O-804353. of Fort Wayne, IN. 1942.
of Chicago, IL. in 1942. John Muir was his instructor at Douglas. He had Basic at Greenwood, Miss, and graduated from George Army Air Corps Field, Lawrence County, IL. S/N: O-804360. He was a B-17 pilot assigned to the 452nd Bomb Group 731st Bomb Sqdn flying his missions from England. He was recalled for the Korean war. Probably graduated from Primary School in Douglas with the class of 1943-F.
For a picture of Long with Instructor Cunningham, click here. John Murr was his instructor. Had Basic at Greenwood. Graduated from George Army Air Corps Field, Lawrence County, IL. S/N: O-804361. of Seffner, FL. in 1942. Had Basic at Greenwood, MS. S/N: O-804362. He was a B-17 pilot assigned to the 301st Bomb Group 419th Bomb Sqdn on March 5, 1944 flying his missions over Southern Europe and was shot down on April 2, 1944 becoming a P.O.W. imprisoned at Sagan, Germany. (MACR #3707; A/C: 42-31639)He retired disabled as a 1LT from the USAAF on November 24, 1946. John Murr was his instructor. Basic at Greenwood, MS. Graduated from George Army Air Corps Field, Lawrence County, IL. S/N: O-804363. He was in the 96th Bomb Gp. On Feb. 25, 1944, he was the pilot of a B-17G (S/N: 42-39841) on a mission to Germany. He was shot down and seriously injured. Click here for more information. of Johnsonburg, PA. in 1942. Fritche was his instructor at Douglas. He had Basic at Greenwood, Miss. and graduated at George Army Air Corps Field, Lawrence County, IL. He went into B-17’s. Was in 351st Bomb Group in England. Click here to view his bio, a detailed write-up on one of his missions, a picture and other correspondence (a PDF). W. M. Fritche was his instructor at Douglas. He had Basic at Greenville, MS. in 1943. He had graduated as a bombardier with the Class of 43-18 at Deming AAFd on December 24, 1943 (S/N: O-754924). He was trained as a bombardier instructor and assigned to the bombardier school located at Deming AAFd in New Mexico where on January 18, 1944 he was killed in a mid-air collision near the field, along with the pilot and eight bombardier cadets. Son of Mr. & Mrs. Ed A. Mahn. Probably born 1919. Had Basic at Greenville, MS.
W. M. Fritche was his instructor. W. M. Fritche was his instructor. Had Basic at Greenville, MS. He graduated with the Class of 43-12 at Big Spring Field on August 26, 1943 (S/N: O-689478). He was a B-24 bombardier assigned to the 460th Bomb Group 761st Bomb Sqdn flying missions in Southern Europe. On a July 7, 1944 mission to Blechammer, Germany, his plane (S/N: 42-78220) was hit by flak. The plane could not keep up with the formation. The crew bailed out over Yugoslavia. He became a P.O.W. for the rest of the war (MACR #6586). W. M. Fritche was his instructor at Douglas. Had Basic at Greenville, MS. Graduated from George Army Air Corps Field, Lawrence County, IL. S/N: O-804369. He was in the 8th Air Force, 94th Bomb Group, 332nd Squadron flying B-17’s. On 24 April 1944, he landed in Germany after a mission over Friedrichshafen in Dübendorf. McCallum and his crew came to the target in heavy anti-aircraft fire. Engine 3 of his B-17 (S/N: 42-97138) began to smoke and it had to be feathered. When he landed, only a small amount of fuel remained. He was interned. On Aug. 27, 1945 the aircraft was flown back to Burtonwood. (See MACR #4159). of Sumner, MO. and/or Menominee, MT. J.B. Knox was his instructor. He had Basic at Greenville, MS.
J.B. Knox was his instructor. Had Basic at Greenville, MS. He graduated at George Field (S/N: O-804373). He was the commanding officer (Lt Col) of the 436th Airlift Wing from August 1, 1961 to June 3, 1965. Paul Schlundt was his Instructor. Had Basic at Greenville, MS. During Advanced he broke his finger, so graduated with Class 43F (S/N: O-807021). He went into B-24’s at Casper, Wyo. He was a B-24 pilot assigned to the 380th Bomb Group 528th Bomb Sqdn flying his missions from Australia and then the Philippines. His plane was named “Queer Deer”. He had 50 Combat Missions. Then he instructed at Walla Walla, Wash.
Paul Schlundt was his Instructor. He had Basic at Greenwood, Miss. He graduated from Napier Field (S/N: O-805091). “Mich” stayed in the Air Force flying A.T.C. and M.A.T.C. until 1964. Then he was hired by United Airlines and flew DC-6, DC-7 and P-727’s He retired in 1983. See comments on Charles B. Moore. Paul Schlundt was his Instructor. Art had Basic at Greenville, Advanced at Napier Field (S/N: O-805094). Then to Odgen Ut. for check out on C-47’s. He was with the 363rd Photo Recon Group 381st PRS flying his missions from England. He also flew P-39’s and was flying a P-51-B (S/N: 43-24789) when he was shot down on June 14, 1944. He bailed out and spent 7 days wandering about. He was captured by the Germans just one mile from our lines. He spent one year as a P.O.W. imprisoned at Sagan, Germany (MACR #5693). He was released when recaptured by our side. The boat hit an iceberg on the way home. Then he was an Engineering Officer at Napier Field. He was testing P-51 & P-47’s. of NJ and later of Catheys Valley, Cal. Paul Schlundt was his Instructor. He started Primary Nov. 24, 1942, soloed Dec, 18, 1942. He had Basic at Greenville and Advanced at Napier Field at Dothan. He went to Kansas City to T.W.A. to check out in DC-3’s. Then he was an instructor at Dallas for 5 months. Next to C-46 transition at Reno. He died in India when the C-46 he was on crashed. Paul Schlundt was his Instructor at Douglas. Cecil had Basic at Greenville where he was delayed to class 43F. He graduated from advanced at George Army Air Corps Field, Lawrence County, IL. Click here for pictures and letter from Cecil (PDF). He left his flying career while at Basic at Greenville, MS. due to health reasons. Paul Schlundt was his instructor. Soloed Dec. 25, 1942. Had Basic at Greenville, MS. S/N: O-803852. He was a B-17 pilot assigned to the 381st Bomb Group 534th Bomb Sqdn flying his 30 missions from England. He then finished his tour and was reassigned to Hendricks Field in Florida where he was killed on January 21, 1945 during a training flight in a light trainer (BT-13A) near Hendricks Field, Florida. See newspaper article about the crash. Probably born in 1919 in NC. From AL during War. “Snow” White was his instructor. Had Basic at Greenville, MS.
“Snow” White was his instructor. Had Basic at Greenville, MS. S/N: O-805100. He was a transport pilot assigned to Rosecrans Field located near Saint Joseph Missouri flying training missions and was killed when his plane caught fire and crashed near Sioux City, Iowa on January 31, 1944. Had Basic at Greenville, MS. He was a B-17 pilot assigned to the 95th Bomb Group 412th Bomb Sqdn flying his 30 missions from England from December 20, 1943 to April 19, 1944. Had Basic at Greenville, MS. He graduated at George Field (S/N: O-804387) was a B-24 pilot assigned to the 389th Bomb Group 565th Bomb Sqdn flying his missions from England. 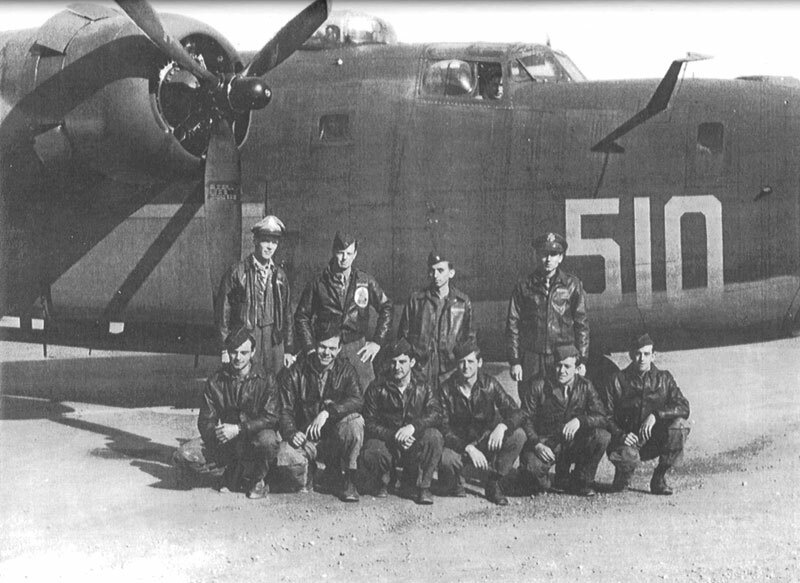 On September 11, 1944 he was pilot of B-24J “Betty” (S/N: 44-40098) with a crew of 10 on a mission to Misburg, Germany. The plane’s engine was hit by flak in the target area. The propeller started windmilling causing drag and the plane lost altitude. Olson decided they did not have enough altitude to clear the North Sea and ordered a bail out. All bailed out except the command pilot who was flying as copilot on board, who finally feathered the engine and reduced drag and was able to fly the plane back to base. Some of the crew became P.O.W.s but Olson was able to evade capture (MACR #8909). Had basic at Greenville, MS. He graduated May 23, 1943 (S/N: O-805105). He was a flight leader in his fighter squadron based in China. Student Officer: Second Lieutenant, Squadron D. S/N: O-444278 (Inf-AUS). Adam was a Paratrooper and transferred to the Air Force. He had basic at Greenwood, Miss. Later he was with the 94th Troop Carrier Sqdn. in Europe. He was discharged in 1946. He was recalled in 1950. He retired as a Lt. Colonel in 1967. Click here for his bio (PDF). Had Basic at Greenville, MS. Graduated from George Army Air Corps Field, Lawrence County, IL. S/N: O-804392. James Puryear and Culver Nesmith were his Instructors. He had Basic at Greenwood, Miss. He graduated from George Army Air Corps Field, Lawrence County, IL. in May 1943. Then he was checked out in B-17’s. He went to the 381st Bomb Group in England in Nov. 1943. He had 30 combat missions. Click here for his letter about his service (a PDF). Had Basic at Greenville, MS. He was assigned to the 379th Bomb Group. In July 1944, he earned the DFC. Bob Lape and Walter Hoffmann were his Instructors. He had Basic at Greenwood, Miss. He graduated from Twin Engine from Lawrenceville, IL. and was soon in China in the 14th A.F. He was a test flight engineering officer in Kunming and Chengkung in 1944-45. He logged time in C-47s, P-38s, P-40s, P-51s, C-46s, C-54s, B-24s, B-25s, and Noorduyn Norsemans. Had Basic at Greenville, MS. He was an A-20 pilot assigned to the 46th Bomb Group based at Will Rogers Field near Oklahoma City, OK in August 1943. Had Basic at Greenville, MS. He graduated from Napier Field (S/N:O-805120). He was a P-38 Lightning pilot assigned to the 370th Fighter Group 402nd Fighter Sqdb flying his missions out of England and on the Continent. Had Basic at Greenville, MS. He graduated from Napier Field (S/N:O-805127). He was a P-38 pilot assigned to the 2nd Photo Recon Group 33rd Photo Recon Sqdn and was seriously injured in a plane crash on March 7, 1944 at Will Rogers Field, Okla when the engine failed. He was retired disabled as a 1LT on December 10, 1946. (see Find-a-Grave). Charles Sherrill was his instructor. He had Basic at Greenville, MS. He was a career Air Force officer attaining the rank of Colonel. He wrote a book “Airland Battle Preparation: Have we Forgotten to Train the Dismounted Mechanized Infantryman” (1988). In 1962, Lt. Col. Severn of York Springs, PA received the U.S. Air Force commendation medal during a ceremony at Westover AFB, Mass. He was awarded the medal in recognition of his meritorious service as an operations staff officer with Headquarters, Eighth Air Force. Sam Snow was his instructor at Douglas. He had Basic at Greenville. He washed out at Napier Field. He was transferred and became a Bombardier and Radar Operator I Navigator in the 14th A.F. He served in the Pacific and spent time in Japan. He stayed in the Service for 20 years and did Radar Maintenance. Clyde Climer was his instructor at Douglas. He had Basic at Greenville, MS. He was a B-24 pilot assigned to the 22nd Bomb Group 33rd Bomb Sqdn (AKA The Red Raiders) flying his missions in the Southwest Pacific Theater. He died in June 1986. He graduated from Freeman Field with the Class of 44E. He was a B-26 Marauder pilot assigned to the 323rd Bomb Group 456th Bomb Sqdn flying his missions out of England and from bases on The Continent. 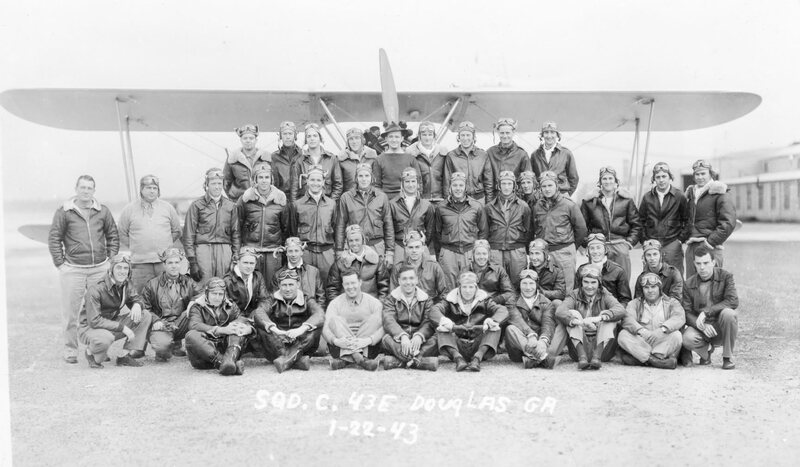 Charles Sherrill was his instructor at Douglas. He had basic at Greenville and graduated from Napier Field. He was a flight instructor at the Advanced Flying School located at Napier Field in August 1944. Student Officer: Second Lieutenant, Squadron B. S/N: O-463901. Had Basic at Greenville, MS. He was an engineer working for the Federal Aviation Administration in the Office of Aviation Medicine. Clyde Climer was his instructor. He had Basic at Greenville, MS. He was a B-24 pilot assigned to the 449th Bomb Group 718th Bomb Sqdn flying his missions out of Grottaglie, Italy. Served in the Pacific after being released from flight school due to vertigo. Had Basic at Greenville, MS. He graduated from George Field (S/N: O-804423). He was a B-24 pilot assigned to the 455th Bomb Group 742nd Bomb Sqdn flying his missions in Southern Europe and was Killed In Action on July 2, 1944 during a takeoff accident. Clyde Climer was his instructor. He had Basic at Greenwood, Miss. Bill graduated at George Army Air Corps Field, Lawrence County, IL. Later he was based at Foggia, Italy and flew 52 combat missions. He retired as a Lt. Colonel in 1972. Click here for his service record and obituary (a PDF). Had Basic at Greenville, MS. He was a B-29 gunner with the Saipan-based 497th Bomb Group 871st Bomb Sqdn. 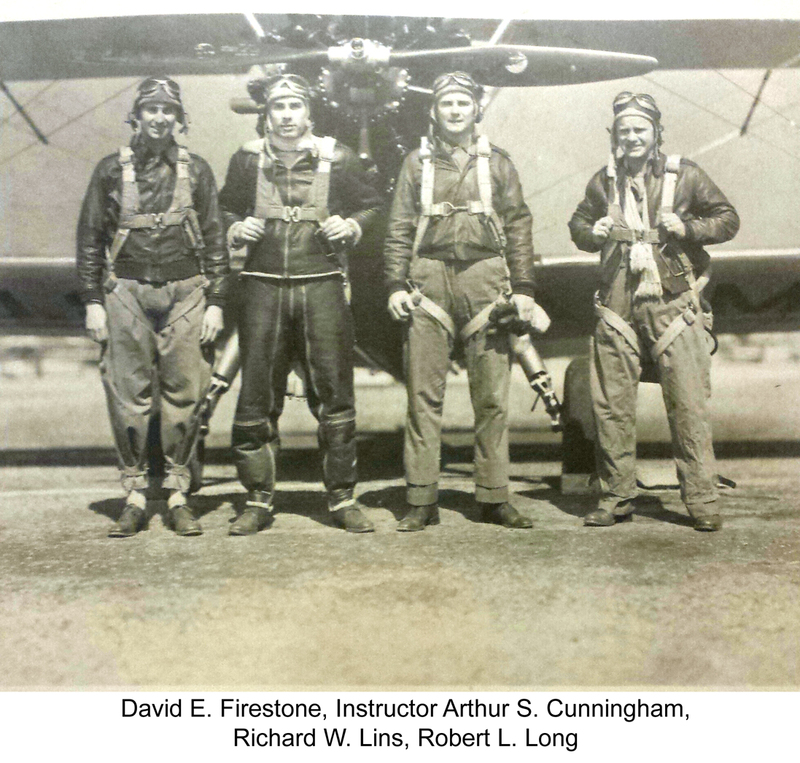 After he finished his pilot training he became an instructor (B-17 IP). He then took a B-29 to Tinian with the 314th Bomb Group. He was a B-29 Superfortress pilot assigned to the 29th Bomb Group 43rd Bomb Sqdn flying his missions from Guam against Japan. He commanded Crew 43-11. He had 9 combat missions and was then selected to Lead Crew School and flew to Muroc, California on 5 August 1945. He got out of the AAC after the war, but enlisted 95 days later as a Master Sergeant. Was a Sergeant Major at McChord in Washington state and Ladd AFB, Fairbanks, AK. Got recommissioned in 1952. Was in personnel, instructor pilot, Inspector General. Retired from USAF in 1964. Raised three boys (2 in US Army, 1 in USMC) and two girls. He graduated from Kirtland Field, NM with the Class of 43-11 on August 5, 1943.S/N: O-752368? He was a B-24 bombardier assigned to the 455th Bomb Group 743rd Bomb Sqdn flying his missions from Cherignola, Italy. Von Hollen, Charles Harold, Jr.
Student Officer: Second Lieutenant, Squadron C. Had Basic at Greenville, MS. He graduated from Craig Field (S/N: O-460010). He was a P-47 pilot assigned to the 413th Fighter Group flying missions from Ie Shima near Okinawa. He was mentioned in MACR #14895, for being in charge of a search detail for a lost pilot. Had Basic at Greenville, MS. He was an A-36 Apache pilot assigned to the 85th Fighter Group flying training missions from Harding Field, LA in August 1943, when he was in a landing accident near the field. Ray Murray was his Instructor. He had Basic at Greenwood, Miss. He graduated from George Army Air Corps Field, Lawrence County, IL. and then was assigned to the 417th Bomb Group. He went to New Guinea and flew 77 missions. He was discharged in 1946. Later he joined the Air National Guard and flew some jets. Then 8 years with the U.S. Army Air Reserve.